Monday September 8: We are exploring today. 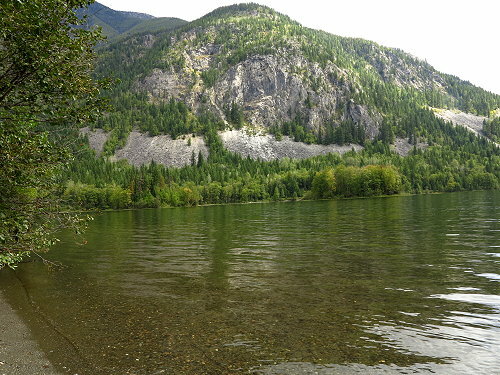 First stop on Highway 6 north is Summit Lake Provincial Park located along the shore of a lovely mountain lake. It is very pretty there, especially those sites that are right on the water’s edge. Maybe this would be a possibility for us next summer. But for right now, we are happy to stay at Rosebery. Our next stop is a forest service camp a ways off the highway: Box Lake aptly named, as one does feel a bit boxed in there. The road is narrow, the camp is dark, the sites are not very level, and the lake is small. Good for fisherfolk, but not so good for Pony campers like us. 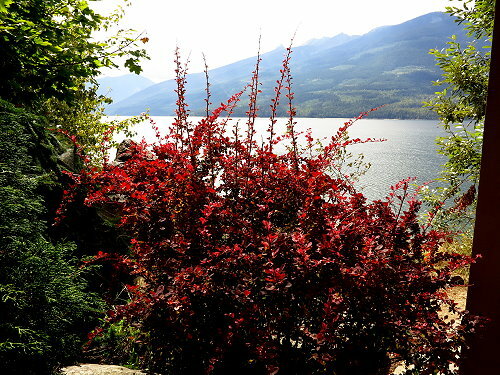 On to Nakusp, which is located along Upper Arrow Lake. It is one of the larger towns in this part of British Columbia, not so much catering to tourists as New Denver, but serving the larger population of the area. We get ice and groceries at a good-size market there. 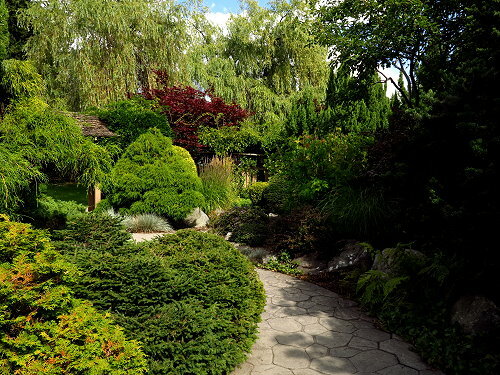 A lovely Japanese garden runs along the length of the lakeside portion of Nakusp, a testimony to the Japanese people who lived in this region since the early 1900’s, but who were treated poorly during the Second World War. 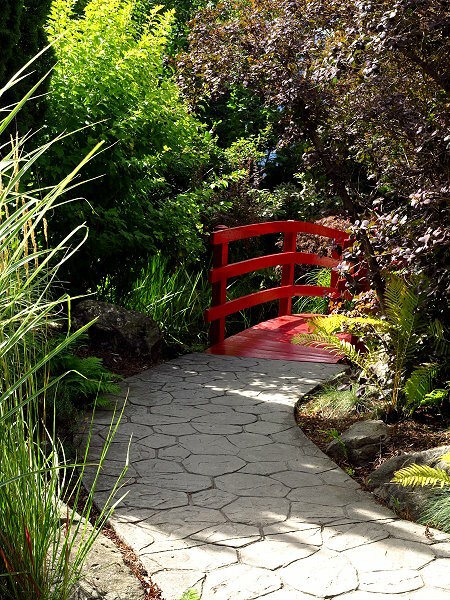 We spend some time there walking through the gardens and along the shore. On the way back to Rosebery, we decide to take a little detour and head up the forest road on the other side of Wilson Creek to see if we can find Wilson Falls. Arriving at the trail head, we take hiking sticks and light rain gear, as it looks like rain could move in before we return. 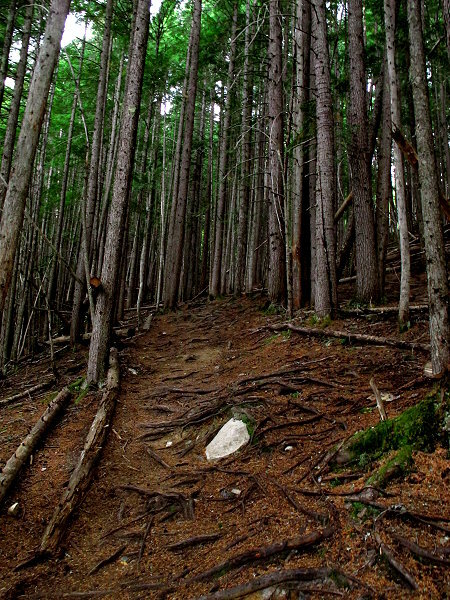 The beginning of the trail is level through a lovely dense deciduous forest. Piece of cake. 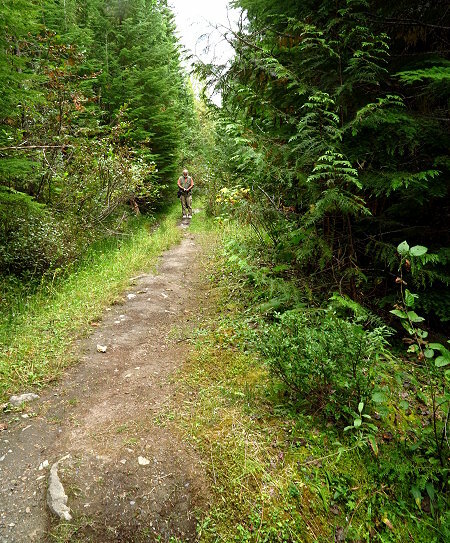 But then, the landscape changes and we begin a steep upward ascent over roots and rocks on the trail through a spruce forest. Not nearly so pretty and much more of a hike. I am finding myself getting quite winded. Not a good sign, but then downhill and I catch my breath and heart-rate is back to normal until the next steep upward climb. I have been an active hiker most of my life, and especially in my 60’s, but again I am winded and my heart-rate is elevated. The wind comes up and my hair is blowing in my face, as I had not planned to hike today and had not tied it up or back. This is not good. So, even though we can hear the falls and catch glimpses of it through the dense trees, we decide not to take the next downhill section of trail. It only means that much more uphill on the way back. If I could have taken my time, I think I would have been okay, but we are pushing a bit because of the time of day and the gathering clouds. This trail will not be a good one to be on if it gets wet and slippery. I hate to miss seeing and taking photos of the falls, but wisdom prevails and we head back with Clifford carrying my small backpack and one of my cameras. I have to stop often to rest until we reach level ground again. I am very grateful to reach the car in the now steady rain. 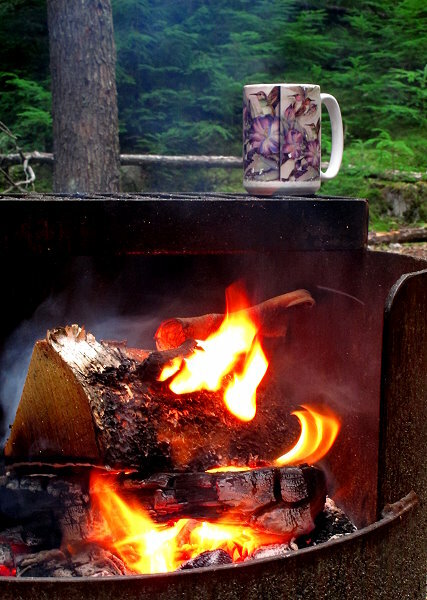 I don’t feel so great as we drive back to Rosebery, but as the evening carries on, I begin to recover from our adventure and build a campfire to extend my outdoor time for today.